Inefficiency can be a huge problem for businesses in many industries. With a business where many of the workers are out in the field or working remotely, it can be even more difficult to tackle problems with efficiency. If you own an electrical contractor business, you need to be able to manage your contractors. This will be accomplished with the all in one Jobi Pro App for electricians. Your contractors need to be able to communicate with you and understand what they’re going to face when they arrive at a new job. If you want to help your technicians work more productively and increase efficiency across the board, an electrician contractor app can help you to do both. When you’re sending your electricians out to work, it’s not always easy to tell just how well they’re performing. You can’t be with them all the time, so how can you know that they are doing their jobs well? How can you identify the things that could be getting in the way of them being as efficient as possible? 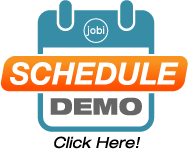 When you use Jobi, you have tools like GPS fleet tracking and electrical service scheduling so that you can improve your monitoring and communication with your technicians. When you can monitor their performance, you can take steps to improve it. 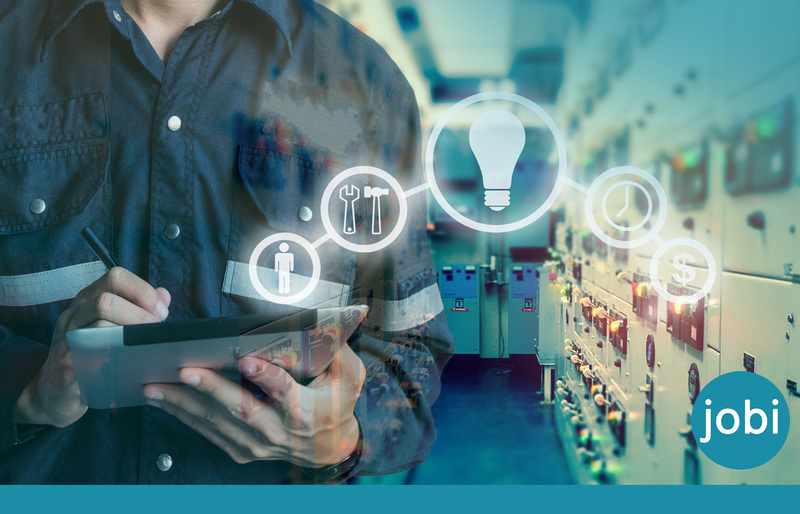 Using software for electrical contractors makes it much easier to manage your products, prices, and extras, such as warranties. You have customizable flat rate pricing with Jobi, so you can easily import your flat rate pricing or adjust the prices on the app to your liking. If you want to allow your technicians to offer special, personalized products to your customers too, you can do that as well. Jobi makes it easy to make service options to suit anyone, with the ability to add on warranties, service plans, product upgrades, and more. This allows you to offer a more flexible service to your customers. With a real-time dashboard, you can see information about calls, scheduling, technicians, any customer and tech information that you might need. This function makes it easier to monitor all areas of your business, look up customer history, and boost conversion rates. You can see how well your business is doing in achieving goals, with great graphics for checking your conversions. Keep track of calls that are in progress, sold, rescheduled or canceled, and keep a close eye on revenue. With more transparency, you can push your company further. Using the Jobi app, you can manage the whole call process in one place with call tracking. From receiving the initial call to sending out a technician and any aftercare, you can track everything. Schedule your calls, assign it to someone who is available, and take payment with just one tool, instead of having to juggle a number of different processes. This makes a lot of sense for any business trying to make their processes more efficient. Your electrician contractor business will be easier to run, and it should improve communication with your technicians and service for your customers. 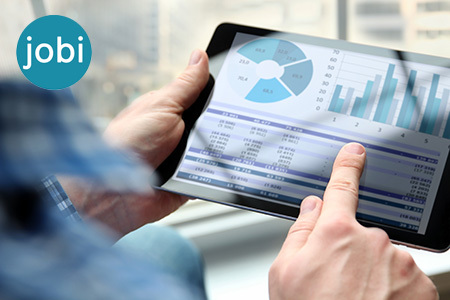 Being able to integrate your key tools with your preferred accounting software is essential. When you can import and export your accounts information, it makes everything a lot easier and more efficient. The Jobi app offers Intuit Quickbooks integration so that the most popular accounting tool works smoothly with our smart electrician contractor app. Accounting can be a time-consuming task, even if you have a bookkeeper or accountant to take care of the majority of the work. Quickbooks integration makes it easier for your office to deal with or helps out your outsourced accountant if you use one. You can keep all your financial information in one place. Invoices are another financial issue that can make your business less efficient. Are you still relying on paper invoices? If so, your business could be much less efficient than it has the potential to be. Paper invoices can slow everything down and cost your business a lot of money too. 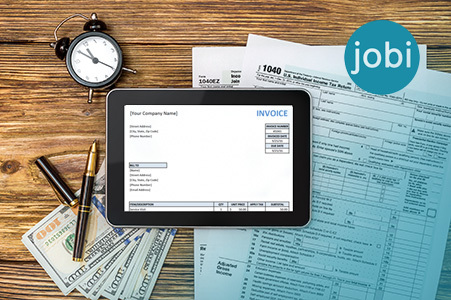 Using paperless invoicing with the Jobi app, everything is much easier. You can create an invoice in seconds, send it back to the office in seconds, and process it more quickly too. They won’t go missing or get damaged like paper invoices have the potential to do. When you have created an invoice, taking payments shouldn’t have to be difficult. There’s no need for your business to rely on cash or check payments, or to wait for customers to pay using a slower method. Jobi helps you to accept credit cards, PayPal, Authorize and Stripe with real-time billing. You can improve your business’s cash flow with more immediate methods of payment, instead of waiting longer for customers to pay or waiting for checks to clear. Miscommunication or poor communication with homeowners certainly isn’t something that you want for your electrician contracting business. It can cause inefficiency problems, and it could leave your customers disappointed. The Jobi app helps with this in several ways, including by offering the option of a homeowners app customized with your brand. This allows them to check their service history and warranty easily, and book you directly from the app. Improve efficiency for your business by offering your customers these tools. You can start making more money with the Jobi app. Make your sales process more efficient with features like call tracking and recording. Optimize your marketing and sales process and raise your ROI when you have the ability to manage customer relationships, see the status of all calls, and see what you’re doing right and wrong. Don’t just speed up your sales process, but make every step more valuable too. Get more from all of your actions and impress your customers, while also helping to make your employees happier at the same time. The Jobi app is designed for field service businesses and is ideal for electricians. Boost your efficiency, productivity, and profitability with one tool.